Switching to Digital Tools: heritage evaluation for preventive archaeology in Hungary. Stibrányi. Internet Archaeol. 43. Archaeological site identification is a thrilling and difficult task. To give precise assessments under difficult circumstances, to understand the landscape along the route of any given motorway, and to know that the assessment has an immediate impact on the archaeological heritage is a challenging task for the archaeologists. In a way, site identification experts can be considered as the goalkeepers of preventive archaeology, for they are not remembered by sites they find, but by sites they fail to identify for any number of reasons. During the last decade in Hungary, preliminary operations for large-scale archaeological excavations have became more and more important: the stakeholders have realised that it is cost-effective to spend more on the assessment phase rather than incurring higher expenditure because of problems related to an ill-planned project. Thorough knowledge of the size and characteristics of archaeological sites can largely contribute to the protection of the cultural heritage, as well as saving time and money. From 2011, so-called 'Preliminary Archaeological Evaluations' have been a mandatory part of the permission process of large-scale constructions (that is to say, a total minimum cost of c.1,600,000 EUR). These evaluations consist of desktop studies (such as analyses of historical documents and maps), as well as field investigations with a budget of 0.35% of the total construction cost. The goal is to make precise archaeological project plans, and to assess the optimal mitigation process. These documentations consist of the establishment of the actual area to be excavated, as well as the cost and duration of the archaeological mitigation process. The funding of further archaeological activities is based on these evaluations, which renders them one of the cornerstones of preventive archaeological activities in Hungary. Strictly speaking, these evaluations cannot actually be considered an optimal method for archaeological heritage management; it would be much better to have a thorough knowledge of all archaeological sites and locations of heritage interest throughout the whole country. In a perfect world, desktop studies would be enough for generating these evaluations. However, we are far from this, so for now we have to focus our resources on construction areas. We assume that, on average, 70% of the sites become known only during the compulsory field surveys conducted during the authorisation process. 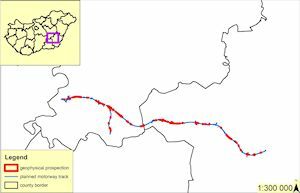 For example, along the track of the NABUCCO gas pipeline, running 384km through seven counties of Hungary, 77 sites had been registered prior to the planning phase. After a single field survey campaign in 2010, this number increased to 339, but taking into account the percentage of areas where survey could not be conducted for some reason, we assume that the total number of sites is at least 400 on the pipeline track. Furthermore, if we take the number of actually known sites and divide it by the area of the individual counties it becomes clear that this number is spatially unevenly distributed and there are large-scale variations (Figure 1). This constitutes a risk with regard to schedules and financial matters for the construction works. As a whole, although it can be said that archaeological evaluations are vital during preventive archaeological processes, it must also be emphasised that a more proactive approach could be achieved by the introduction of regional-scale site identification campaigns. However, currently there is no central initiative working towards this goal. The Forster Centre – and its predecessor – has been responsible for the coordination and execution of preventive archaeological evaluations since 2013. The Forster Centre is a government office acting as an independent third party between the investors and the institutions responsible for further archaeological mitigation processes following the evaluations. In recent years, we introduced and tested a GIS-based method that we found effective in large-scale investments and which – due to financial constraints – relies greatly on non-invasive methods as tools to help our investigation strategies. Figure 2: Distribution of areas available for field survey (plough-walking) in Hungary based on the CORINE land cover map. The Carpathian Basin's fertile loess soils have provided a great potential for agricultural communities since the Neolithic, resulting in high densities of archaeological sites. There is not a great difference today. According to CORINE (Coordinate Information on the Environment) Land Cover maps, more than 55% of the territory of Hungary is arable farmland, which makes these areas ideal to carry out large-scale field surveys (Figure 2). Moreover, the relatively high proportion of clay and loess soils provides a good opportunity to employ magnetic measurements as a standard tool to identify archaeological sites. Given these circumstances, our current strategy relies on three interdependent tasks: GIS-based field surveys, large-scale magnetometer surveys and targeted trial excavations. The first step is always a desktop study and a full-scale systematic field survey over the whole area of interest in order to collect archaeological materials and identify sites and features. 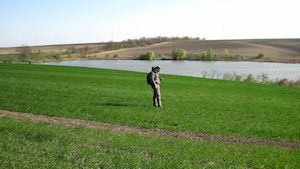 Field survey is one of the most important site reconnaissance methods in agricultural areas, as found throughout most of Hungary. Considering the large number of archaeological sites and the high percentage of farmlands, there is a huge quantity of archaeological data literally lying on the ground's surface (Figure 3). This simple, easily applicable method has been integrated in the archaeological tradition of site detection as well (Stibrányi and Mesterházy 2013). Data obtained from the spatial distribution of surface finds revealed by ploughing have formed a basis for the identification of archaeological sites. Even the term 'field survey' usually refers to surveying farmlands in the terminology. 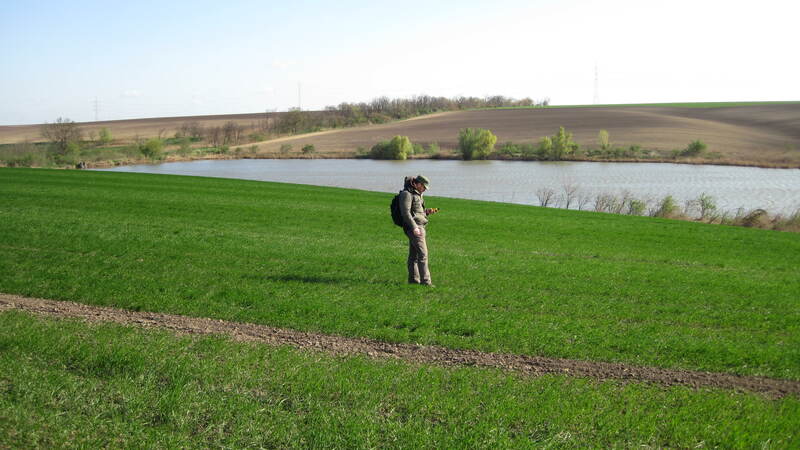 Most of our knowledge about sites comes from plough-walking; the first and only intensive and extensive, government funded, national scale field survey project, called the Archaeological Topography of Hungary, was in operation from the 1950s to the 1990s. This project identified about 10,000 sites throughout 11.7% of the country, based on extensive field survey (Wollák 2004). Data from these earlier field surveys (certainly, without any GIS support) were quite useful for approximating the location of the sites but, on the other hand, they were highly inaccurate regarding site size. However, in our experience most of these problems were due to the lack of GIS, and were not attributable to shortcomings by the field archaeologists at that time. Documenting the location of each find at the surface with handheld GPS within an adequate sampling density can be a surprisingly effective method in ploughed areas (Figure 4). On the other hand, we have to conduct our surveys quickly and effectively to be able to maintain the same standard in every survey. So as a standard, every project's first step is to conduct a systematic field survey with 25m intervals in the whole area of interest, collecting and marking each 'find-spot' with handheld GPS. The resulting point cloud is a fast but quite useful and fairly accurate way to determine the focus of our archaeological interest. Due to the nature of archaeological features, we cannot expect to find everything using solely this method, but we expect to find the substantial majority of those 'find-spots' that are the most problematic ones considering the given development. In the next phase of a non-invasive analysis, magnetometer surveys are performed within these areas – including also areas with no surface finds, but exhibiting a high potential for archaeological features – in order to identify the actual archaeological areas. This type of survey usually does not include entire sites or development areas, but typically covers at least 30-50% of the study area (Figure 5). We must emphasise the integrated use of geophysics in the investigation, not just as a method but also as an applied heritage management tool. In general, the geological conditions of the Carpathian Basin are favourable for the use of magnetometers for archaeological purposes. Much of the country's soil is clay or loess, which usually facilitates obtaining good magnetometric readings. However, there are also areas that have sandy soils, which have proven more problematic for magnetic surveys. 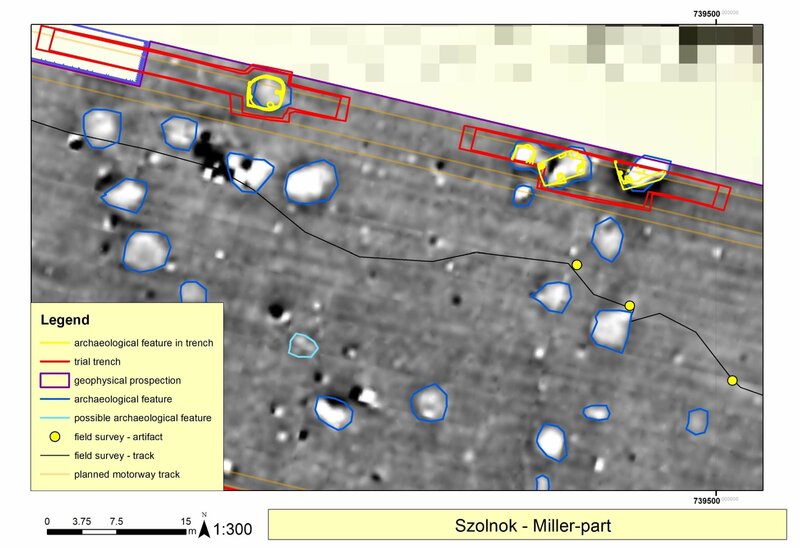 Geophysical surveys have quite a long history in Hungarian archaeology (e.g. Raczky et al. 2002). Building on these past efforts, the time has come to try a much more integrated approach. Formerly, the results of geophysical investigations were scarcely used in the decision-making process of preventive archaeology. When it happened, it was done strictly for archaeological feature detection and not for prospecting the site's extent, as it was quite costly. Taken together, geophysical prospection was considered more as a tool to be utilised for scientific projects and not as a widely used heritage management tool. However, it is our strong opinion that geophysical investigations should be integrated into regular site identification strategies of preventive archaeology whenever possible in order to be used to its fullest potential and make useful predictions. As a standard procedure, every archaeological site that overlaps with a planned development area should be fully surveyed (Figure 6). Field archaeologists responsible for excavations should be provided with support to understand and use these data during the planning phase. In order to perform optimally in the challenging environment of preventive archaeology, methods and procedures should be intricately connected. 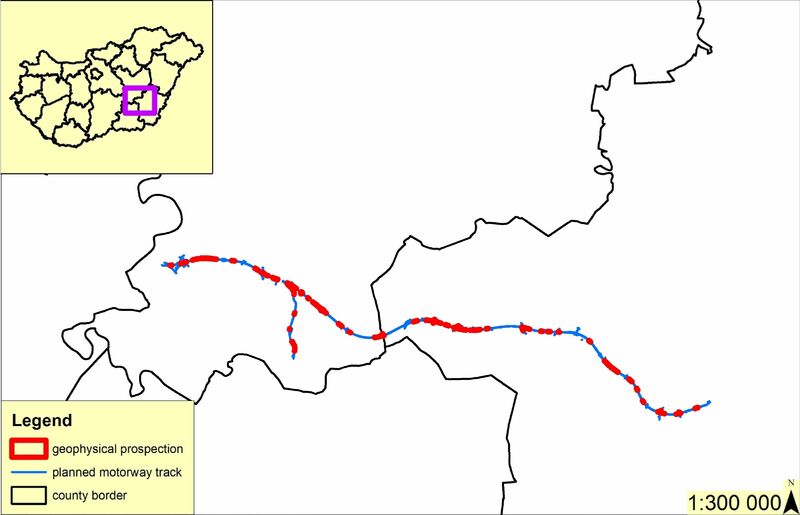 Figure 6: Magnetometry survey (6a), and its interpretation (6b) at the planned M35 motorway's route. In the Forster Centre's Department for Archaeological Prospection, geophysicists, archaeologists and geologists work alongside one another on projects. It is imperative that everyone needs to understand the basic principles of each others' activities to some extent. For instance, archaeologists should be capable of performing magnetometer surveys, and geophysicists should be able to help conduct field surveys (Figure 7). By establishing our own team and having our own equipment, this method can be cheap, fast, and flexible. Having our own team we are able to make last minute changes in the extent of the survey area, or to do unscheduled or unexpected surveys. A system-wide integration also can create datasets on such a large scale that they could be useful for achieving the long-term goals of archaeological heritage management. For example, it makes it possible to understand where and under what circumstances magnetometry can actually be useful and where it is inefficient. It is widely known that magnetometry is a remarkably productive tool for site identification; its power has been demonstrated many times. However, when we use it for cultural heritage management purposes, different questions must be asked, because we cannot choose what we want to survey in those instances. We work on different motorway and other projects throughout the country, characterised by different soil types, searching for diverse archaeological features, and we have to give precisely measurable and practical assessments at each location. As the third step, the previously collected data are validated through trial excavations. Funding is usually very limited, thus the trenches are laid out based on the results of the field survey and magnetic prospection either to validate archaeological features or confirm the lack of them. The current legislation also limits the extent of trial excavations at archaeological sites in development areas. Obviously, this approach is based on surface finds, and therefore has a restricted potential regarding archaeological features invisible during field surveys. Nevertheless, considering limited financial resources, we must focus on areas where the presence of archaeological features can be confirmed. 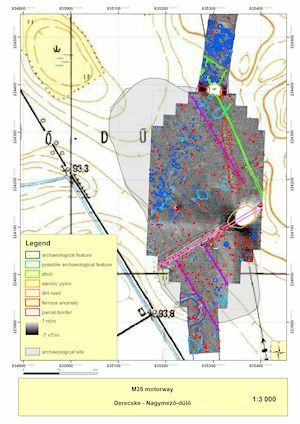 In general, at least 30-40% of the entire project area is covered by magnetometry survey. If needed, we also can carry out supplementary surveys, such as coring, aerial archaeology or GPR survey. The scale of our tasks is challenging and demanding at the same time: the investigation of large areas with various methods gives us substantial and reliable datasets on the archaeological landscape. 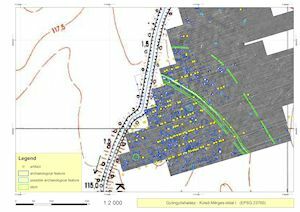 The opportunity to perform surveys in differing areas and validate their results via excavations provides archaeologists with a very powerful tool to comprehend the advantage of magnetic survey for archaeological heritage management. Collecting and comparing these GIS-based datasets on a nationwide scale gives us an opportunity to determine the most effective methods to identify and protect the archaeological heritage. One of the most promising opportunities is to create a comparative database, where the outcomes of geophysical surveys and excavations from hundreds of hectares are available across the country (Figure 8). Beginning in 2013, magnetometric surveys have been carried out for more than one hundred projects, and included 360 archaeological sites, measuring an approximate total of 500 hectares. Using the results, we can set up a comprehensive archaeological geophysics database that would facilitate making our magnetic prospections more accurate and our methods more targeted. In Hungary, usually 1-2 years pass before the excavation phase of a project starts, and after the excavations the archaeologists have an additional year to finish final documentations. Up until now, we only have processed data from five projects, with a total excavated area of 27,000m², and 500 archaeological features. Of those, we have received full documentation (thickness, depth etc.) for c.110 features. We compared those features to see the method's weaknesses and strengths. It has proved to be a more complicated task than it seemed, because there is a large variety of archaeological features, and it was quite difficult to hold on to the specific attributes. We classified the data using topsoil depth above features, and the thickness and area of features. Usually, we were unable to recognise the shallow features, but our magnetic results were very effective with regard to features deeper than 0.5m. It also seems that the topsoil depth (above features) had minimal impact, whereas size appears to be a more important factor in detection. All in all, we were quite efficient in finding larger features, but problems occurred regarding smaller and shallow ones. It seems that diverse features representing different archaeological periods were identified differently by magnetometry. Soil types, feature size, and topsoil depth also significantly affect the magnetometry results. That is to say, there are a great number of variables, which influence the interpretation and reliability of geophysical data, including also archaeological features that have no measurable magnetic attributes. Another problem to be addressed is that some archaeological features are not deep enough to reach the subsoil. In Hungary, the topsoil is usually removed all the way down to the subsoil as the first step of preventive excavations. Although this may be a detailed procedure if an archaeologist is present, it cannot be ruled out that some features are not detected in the topsoil. Taken as whole, given the large number of variables that affect reliability, there is still a lot to do concerning the interpretation of the results of magnetic surveys. This is not an impossible task; we only need a lot of measurements and verification of the results in order to evaluate survey data properly. The more data we gather regarding comparisons between magnetometer surveys and succeeding archaeological excavations, the more we can explore the relations between magnetic anomalies and actual features. Our task is to define as accurately as possible what we could or could not learn from a magnetometer survey in any given area. 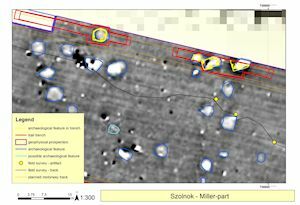 As was mentioned before, the clay soils of the Carpathian Basin are usually favourable for the use of magnetometry, and most of our projects have been carried out on those soils. However, of the c.100 projects involved, there have been only four projects where we performed magnetometer surveys on soils with drift sand. We were practically blind in those areas regarding the magnetometer results, and only very few of our predictions were useful. There is another problem, which mainly affects a specific group of features, namely the large cemeteries with inhumations located away from settlements. This custom was established from the Copper Age onward, but used mostly in the early medieval period in the Carpathian Basin, and they are a significant hazard regarding the heritage protection procedure. For example, an undocumented early medieval cemetery containing several hundred graves with rich grave goods situated within the line of a motorway can constitute a major risk for the whole archaeological mitigation process. Unfortunately, we cannot expect to find graves through geophysical surveys (apart from those burial customs having large circular ditches around the grave, e.g. the Sarmatians). We are capable of locating predominantly settlement features by magnetometry – and they are the overwhelming majority of features we usually deal with in any given development area – but the identification of cemeteries remains our biggest problem, which cannot be addressed through any sort of fast detection method, apart from aerial archaeology and trial trenching. By comparing the results of magnetometer surveys and excavations, we estimate an overall predictability of 80 per cent of features (for true positive and true negative values) during our prospections. If we could further evaluate the data derived from this constantly growing dataset, it could serve as a strong argument to persuade stakeholders to utilise these analytical methods more systematically, giving the archaeologists more chances to obtain information about the affected archaeological sites and making the mitigation process more effective. 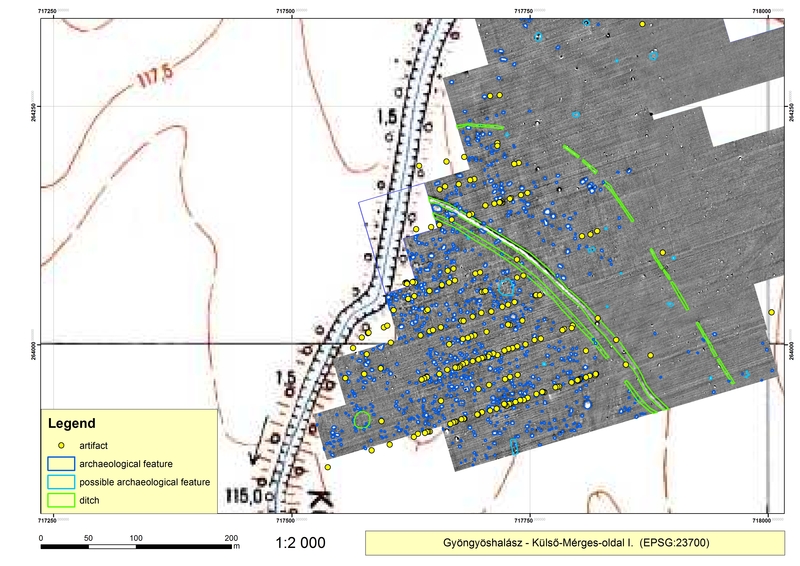 The next step in exploiting geophysical opportunities for archaeological heritage management is to collect more data throughout Europe, where geophysical surveys and excavations can be compared in order to understand the results, and to provide transparent information about the methods and possibilities of site detection opportunities, and their use as a standard procedure for the planning phase of future construction projects. The next step in exploiting the geophysical opportunities for archaeological heritage management should be to collect more and more data throughout Europe where geophysical surveys and excavations can be compared to understand the results, so giving transparent information in the planning phase about the methods and possibilities of site detection options and these should then be adopted as standard procedures. First of all I would like to express my gratitude to my colleagues: Nóra Buránszki, Bence Kecskés, Gábor Mesterházy, László Nagy, Mihály Pethe, Dávid Pintér, Ferenc Somogyi, Eszter Soós and Péter Takács for their dedicated work. The team had at least 140 field survey days every year since 2013, and so far altogether more than 2000km was covered on foot during surveys. I would also like to thank Gábor Mesterházy for some of the figures in this article and last but not least Attila Gyucha and Danielle Riebe for their language editing and for their useful advice. Raczky, P., Puszta, S., Czajlik, Z., Holl, B., Marton, Á. 2002 'Investigation of archaeological sites with the integrated application of aerial photography, magnetometer surveys and archaeological excavation' in E. Jerem, K.T. Bíró and E. Rudner (eds) Archaeometry 98. Proceedings of the 31st Symposium, Budapest, April 26-May 3 1998, Volume 1, British Archaeological Reports International Series 1043(1). 135-42. Stibrányi, M. and Mesterházy, G. 2013 'Walk the line. Implementation of regional-scale GIS-based field survey method for agricultural areas in Hungary' in W. Neubauer, I. Trinks, R.B. Salisbury and C. Einwögerer (eds) Archaeological Prospection, Proceedings of the 10th International Conference, Vienna, May 29th - June 2nd 2013. 193-95. Wollák, K. 2004 'The protection of cultural heritage by legislative methods in Hungary' in E. Jerem, Z. Mester and R. Benczes (eds) Archaeological and Cultural Heritage Preservation within the light of new technologies. Selected papers from the joint Archaeolingua – EPOCH Workshop. 27 Sept–2 Oct 2004, Százhalombatta, Hungary. 73-82.